The bridal bouquet remains one of the most important elements in the wedding ensemble. Far more than a mere collection of the bride’s favorite flowers, the bouquet completes the look that is both suited to the wedding theme and symbolic of her personality. Below are three creative ideas for making this bridal accessory just as meaningful as it is gorgeous. A cherished photograph of a person dear to the bride, such as her husband-to-be, her mother, or her best friend, may be nestled amidst the flowers, or placed in a lightweight frame and tied to the bouquet with a satin ribbon or braided cord. A motif based on the theme of the wedding, such as a seashell, a heart, or a flower, may either be embossed on the band itself or appear as a jeweled charm dangling from the band on a fine chain. A pattern taken from the details of the wedding gown may be embroidered on the band. 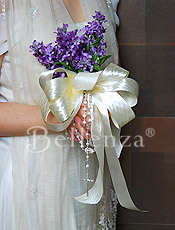 For a wedding with a religious tone, the bride may carry a small Bible or prayer book with the bouquet. These can even have a sentimental value if they are family heirlooms. 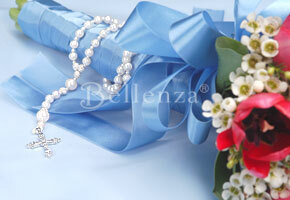 A silver rosary may be draped from the bouquet to honor the bride’s religious background. 1. Bejeweled fabric, pearls, or colored rhinestones can be wrapped around the handle of the bouquet. These bands may span the entire length of the handle or can simply be draped over the flowers. 2. For a Catholic bride, a rosary is a meaningful way to honor her religious background. This rosary may in fact be a precious family heirloom. 3. A vintage piece of jewelry, such as a brooch handed down from a godmother or an aunt, can be securely attached to the bouquet or sewn into its band. Jeweled accents like these should be complemented with the right flowers. Ivory roses or stephanotis, for instance, look fabulous with a pearl rosary. A monogram of the bride’s initials may be embroidered on the handle of the bouquet. A satin ribbon bearing the first letters of the bride and groom’s first names could be laid in swirls around the flowers. A special tag can display the bride’s first name and her soon-to-be new last name. As an alternative to initials, the bride’s family crest, should there be one, may also be incorporated into the design of the bouquet’s band. If the groom’s family has a family crest as well, this may be displayed alongside that of the bride’s. With all eyes on the bride during the wedding ceremony, it is only right that her ensemble include a stunning bridal bouquet. But beyond that, special touches may be added so that the bouquet holds a meaning for her and her loved ones befitting this most memorable occasion. For my bouquet, I will be using paper flowers colored in bright red. My color palette will be white and red so the flowers will be nice contrast.